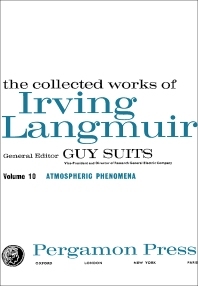 Atmospheric Phenomenon is composed of different essays written or co-authored by Irving Langmuir. The essays explore the different parts that form the atmosphere. A section of the book describes the evaporation of small spheres. Another section is about the radial flow in rotating liquids. The book also covers the light signals in aviation and navigation. An essay that describes the airplane tracks in the surface of stratus clouds is then provided. Some of the essays contained in a section in the book focus on the process of cloud seeding. This section explores such topics as smoke filters, cloud droplets, and water droplet trajectories. Another section in the book is especially devoted to the methods of cloud seeding using dry ice, silver iodide, and sodium chloride. The book can be a useful tool for aviation scientists, engineers in the field of aerial navigation, and individuals whose field of study is mainly on weather manipulation and control.